Welcome to our third exclusive Free Mystery Block of the Month by Pat Sloan! This year Pat's theme is 'The Secret Garden.' She has plans to share gardens she has visited, ones she has heard about and some that might be so secret they are hard to find! Block three is the 'Japanese Tea Garden.' We love how Pat got interested in Japan from an early age. Also watch her series of video quilting tips this for us this year. All the past blocks and supply list are at our landing page. For those waiting to use my Hometown Girl from Moda, it is available in quilt shops now! 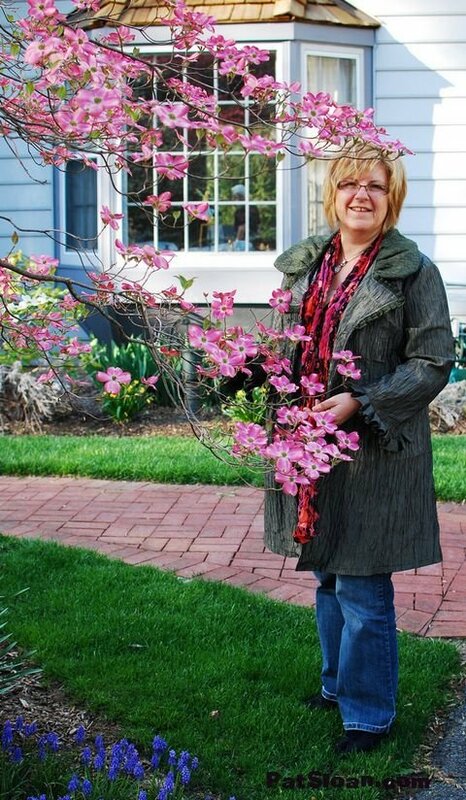 It is March, and in my part of the world, here in Virginia, that means spring will finally start in a few weeks. Visiting a garden in spring is the best thing to do!! For our blocks this month I thought about what kind of garden I would love to see that I haven't visited yet. That would be a traditional Japanese Tea Garden. I have constructed our block with squares, rectangles, and half-square triangle units. All nice and easy for a 'almost spring' block. This year the blocks are nice large 16.5" x 16.5", so we will have a fun lap size quilt when done! Two months this year you'll make 2 blocks so we have a 3 x 4 structured block layout. The layout diagram is at the end of the pattern. In sixth grade I read a lot of books, the library was my home. At one point I read the book 'The Good Earth' by Pear S. Buck. Yes in 6th grade, what a big book that was. After reading it I become quite infatuated with anything and everything about Asia. My family was living in Germany for my dad's work, and I had a very multicultural school. All of this became my love of things not only Asian, but Japanese. I began building tiny shoe box dioramas of Japanese homes using books from the library. For My Secret Garden this month I want to Celebrate the Japanese Tea Garden. What I have found is that these are built all over the world, so I could actually find a tea garden in many cities and towns! Maybe your town has one, if they do, list it in the comments, I'd love to look them up! Japanese Tea Gardens - are traditional gardens that create miniature idealized landscapes, often in a highly abstract and stylized way. The gardens of the Emperors and nobles were designed for recreation and aesthetic pleasure, while the gardens of Buddhist temples were designed for contemplation and meditation. From being a little girl, until now, anything tiny and structured has held great appeal to me. A garden with hidden trails, small vignettes, are so amazing and delightful! And my vision of the garden would be one with loads of pink flowers!! That dogwood in the photo above is at my Dad's home. I did a little research to find Japanese Tea Gardens in the United States, as those are the ones I'd most easily be able to visit. 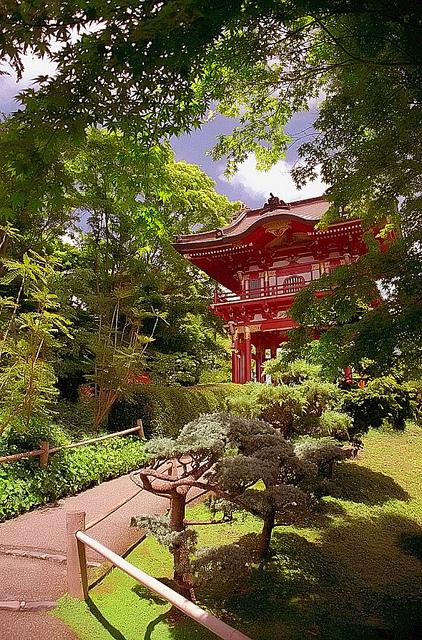 A Japanese-style garden in the heart of San Francisco’s Golden Gate Park. 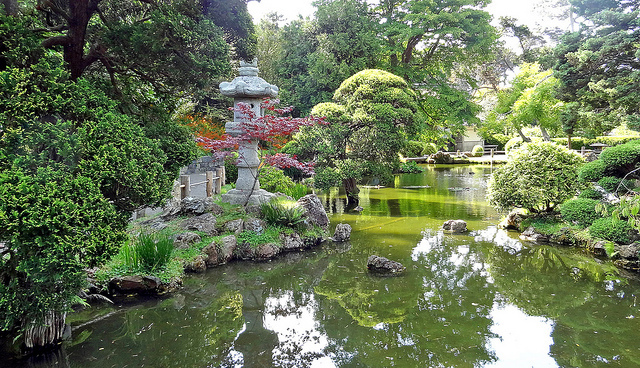 Originally created as a "Japanese Village" exhibit for the 1894 California Midwinter International Exposition, the site originally spanned about one acre and showcased a Japanese style garden. I found this story about a Japanese Tea Garden built in the 1916 in San Antonio Texas. The link is an article on it being built with old photos that are really interesting. You can visit it still, learn more here. And one more! I did a search for one in Virginia, and found one. The Pagoda and Garden is located at Freemason Harbor on the Downtown Norfolk Waterfront. The Pagoda was a gift to the city in 1983. In my Tutorial Video this month I tell you an alternative way to making the strip sets in this block! Each month I have a new tutorial on a quilting technique or tip, be sure to watch the video!